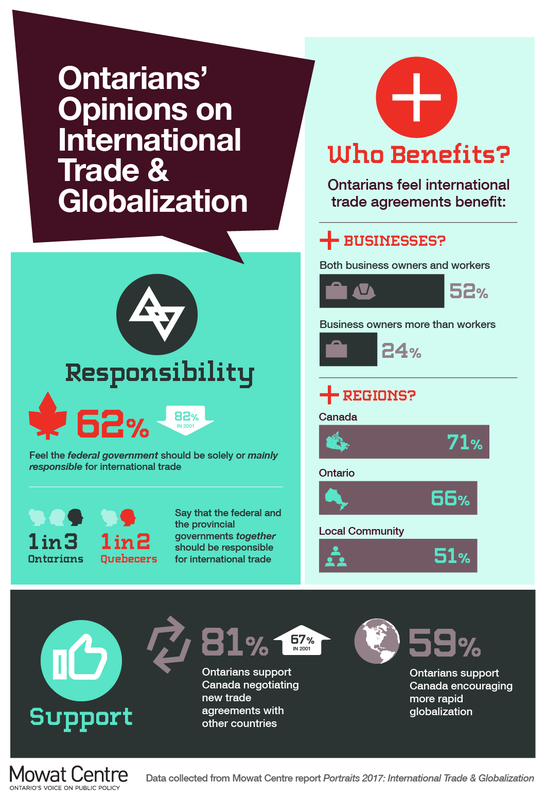 Most Ontarians support international trade agreements and a majority of Ontarians support more rapid globalization. 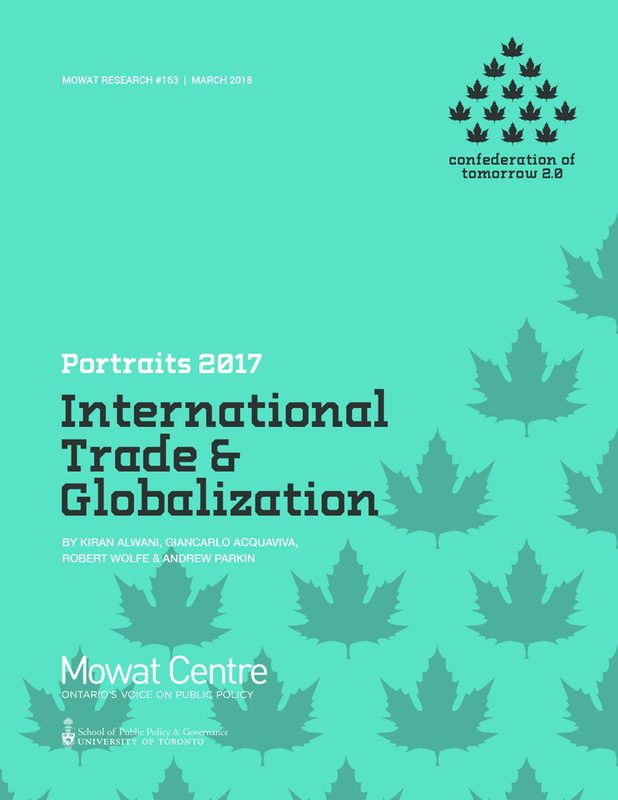 These are among the main findings in the latest report from Mowat’s Portraits 2017 survey series. The report analyzes data from a survey of 2,000 Ontarians and 1,000 Quebecers conducted in November 2017 – significantly larger samples than typical for national opinion polls. Its findings offer reassurance to Canada’s governments as they continue working to preserve, implement and expand international trade agreements. But the report also finds several cautionary notes for policy-makers. For instance, 60 per cent of Torontonians think international trade benefits their local community, whereas in eastern and southwestern Ontario only about four in ten share this view and about three in ten believe international trade harms their community. A plurality of Ontarians say that the US benefits more than Canada from trade between the two countries. Ontarians under 35 are now less supportive of international trade and globalization than are older Ontarians, and about a quarter of Ontarians are opposed to more rapid globalization. The UK is leaving the European Union, the world’s largest single market. The US has walked away from a trans-Pacific trade accord and has triggered a renegotiation of the North American Free Trade Agreement (NAFTA). Do these moves signal growing public skepticism in Western democracies about the benefits of globalization or the importance of international trade deals? In the case of Ontario, does the public continue to support trade and trade agreements? The recent Mowat Centre Portraits 2017 survey finds that the answer to the latter question is yes. Of course, the Brexit vote was driven by discomfort about issues well-beyond trade – notably the free movement of workers across borders. And President Trump’s “America First” agenda is not merely a response to fears of globalization. At the very least, though, both developments show that public support for the ever-increasing integration of economies cannot be taken for granted. This complex mix of positive and negative signals may have impacted how Canadians assess the benefits of trade liberalization. Does the Canadian public remain as supportive of trade and globalization as it was at the turn of the millennium? Has support for international trade agreements eroded in the wake of recession? Does the intense coverage of American angst about trade have a spillover effect (either positive or negative) on Canadians’ views? Knowing more about public attitudes matters for policy. It is certainly important for policy-makers to know whether public opinion on trade issues and government actions are aligned. In the US, at least, there is evidence to suggest that the extent of the public’s souring on NAFTA has been over-stated, and that something other than public attitudes towards trade deals is driving the current administration’s policy choices. In Canada, the reverse situation may be true; that is, the government’s enthusiastic pursuit of new international trade agreements may mask public skepticism about their benefits. People from certain demographic groups, or from regions hit hardest by recession and job loss, may not necessarily feel that international trade agreements are benefiting them or their local communities. The Portraits 2017 survey on public opinion in Ontario was designed to address these questions. This report explores whether, more than 15 years after the landmark 2001 survey cited above, the attitudes of Ontarians relating to trade and globalization have shifted. The survey shows that Ontarians are broadly supportive of trade and globalization. That support has risen over time, as the proportion that has no opinion has fallen. However, Ontarians are also more likely to see these benefits accruing to the country or the province as a whole rather than to their local community. A slight majority of Ontarians say that both the owners of Canadian businesses and workers in Canada benefit from international trade agreements, but almost half say that the United States benefits more than Canada from trade between the two countries. The latter finding perhaps reflects shifting attitudes towards Canada’s relationship with the United States in the wake of the 2016 presidential election. The Portraits 2017 series analyzes survey data from a comprehensive study of public opinion in Ontario and Quebec. The survey focused on a wide range of subjects, including federalism, the economy, social programs, international trade, immigration and diversity, and relations with Indigenous peoples. The data provides valuable new evidence about whether and how citizens’ attitudes towards one another, to the federation and to Canada are evolving at a time of considerable change and uncertainty in the wider global political context.